Join featured performers for a show followed by a discussion moderated by Jennifer Patterson. Join editor Jennifer Patterson, contributor & #LoveWITHAccountability founder Aishah Shahidah Simmons and Dr. Tonya Edmond of Washington University in St. Louis as they discuss sexual violence, LGBTQ communities and more. There will be a signing and meet and greet after. Please join us for a reading and Q&A for the anthology Queering Sexual Violence: Radical Voices from Within the Anti-Violence Movement. Contributors Peri Rainbow, Ida Hammer and editor & contributor Jennifer Patterson will be reading. The bookstore let us know that they are wheelchair accessible. And please refrain from wearing scented products and perfumes (including essential oils) to make the space more accessible to people who need low scent/ no scent spaces. (And if you do laundry before the event please use scent free detergent.) Please let us know if you have other access needs. Thank you! 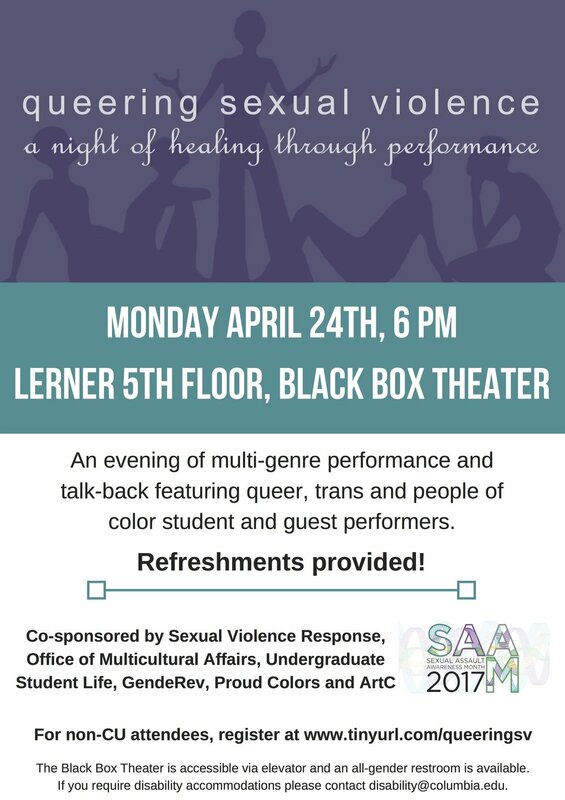 Please join us for the much anticipated release of the anthology Queering Sexual Violence: Radical Voices from Within the Anti-Violence Movement. There will be a reading with contributors Darnell L. Moore, Nitika Raj, Ida Hammer, Samantha Barrick, Aishah Shahidah Simmons, foreword writer and contributor Reina Gossett and editor and contributor Jennifer Patterson. There will also be some time for a discussion. Bluestockings Bookstore’s safer space policy is intended to help Bluestockings be a supportive, nonthreatening environment for all who participate. We want this place to be welcoming and engaging, and we encourage everyone – visitors, events presenters, volunteers and collective members – to be proactive in creating an atmosphere where the safety of others is validated. In this spirit, we are survivor centric and survivor oriented, and violence, abuse, sexual assault and discrimination will not be tolerated. Everyone entering Bluestockings Bookstore is asked to be aware of their language and behavior, and to think about whether it might be harmful to others. We define oppressive behavior as any conduct that demeans, marginalizes, rejects, threatens or harms anyone on the basis of ability, activist experience, age, cultural background, education, ethnicity, gender, immigration status, language, nationality, physical appearance, race, religion, self-expression, sexual orientation, species, status as a parent or other such factors. *Respect peoples’ opinions, beliefs, experiences and differing points of view. *Respect everyone’s identity and background, including pronouns and names. Do not assume anyone’s gender identity, sexual preference, survivor status, economic status, background, health, etc. *Respect everyone’s physical and emotional boundaries. Check in in before discussing topics that may be triggering (e.g. sexual abuse, physical violence or encounters with police), and use trigger warning during presentations and events. Physical and/or verbal threats will not be tolerated at Bluestockings under any circumstances. Disruptive individuals may be asked to leave the space. *Be responsible for your own actions; be aware that your actions have an effect on others, despite what your intentions may be. *Listen and change your behavior if someone tells you that you are making them uncomfortable. *Be aware of your prejudices and privileges and the space you take up at Bluestockings. *Alcohol is permitted only during pre approved special events, and we request that it be used with moderation at those times. The collective members and staffers at Bluestockings are empowered to enforce these rules. If you cannot abide by the guidelines mentioned above, Bluestockings reserves the right to ask you to leave. If you experience harassment, abuse, or sexual assault, or if a perpetrator of sexual violence is interfering with your participation or presence at an event or in a space, please approach a Bluestockings collective member orstaffer whom you feel comfortable talking to in person or via email. They are here to help with any conflicts arising from the violation of our policies.